Continuing on my series of people that have influenced me of late. Very few scientists have had the chance to touch the public consciousness like Richard Dawkins. I became aware of Prof. Dawkins via my interest in Doctor Who and Douglas Adams. Back in the day I was a huge fan (still am) of Doctor Who and one of my favorite characters was the Time Lady Romana II. I had known that Lala Ward was friends with one of my favorite authors, Douglas Adams. I had heard sometime later that he had introduced her to Richard Dawkins (And how Dawkins and Adams had own two of the very first Macintosh computers in England). 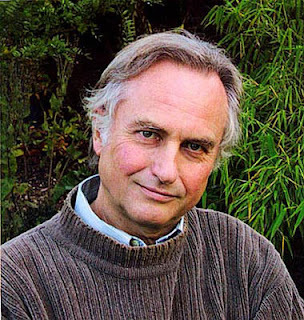 I learned more about Dawkins and I wanted to read his books. I only got the chance recently and I read The God Delusion and the Greatest Show on Earth in rapid succession. Dawkins is well spoken, eloquent in his descriptions and explanations. He is also quite strong in his Atheism, though on his own rating scale he gives himself a 6 on spectrum of 1 to 7, with 7 being "Absolute Atheism, no chance what so ever of a god". I put myself at something like a 6.9. Because of his views he is often attacked by Christians and others. Apparently unable to attack his views they resort to ad hominem attacks on the man himself. I still have quite a bit to learn, but I am looking forward to reading his books The Devil's Chaplin and The Selfish Gene. If you are at all curious about the scientific basis of atheism then you can do much worse than reading Dawkins. It takes a lot of courage to openly speak out against what many believe. Personally, I find those who try to push their religious doctrine on me to be totally annoying. Thanks for stopping by my blog. I know of Yes, but must admit not a whole lot. No, they won't be my Y! Interesting theme you have here, I learned something new. The Selfish Gene is my favorite book of his. It's also the least preachy of atheism. Just solid science.